Nadeau S, Meirmans PG, Aitken SN, Ritland K, Isabel N. 2016. The challenge of separating signatures of local adaptation from those of isolation by distance and colonization history: The case of two white pines. Ecology and Evolution 6 (24): 8649-8664 [open access]. Hodgins KA, Yeaman S, Nurkowski KA, Rieseberg LH, Aitken SN. 2016. Expression divergence is correlated with sequence evolution but not positive selection in conifers. Molecular Biology and Evolution 33 (6): 1502-1516. Suren H, Hodgins KA, Yeaman S, Nurkowski KA, Smets P, Rieseberg LR, Aitken SN, Holliday JH. 2016. Exome capture from the spruce and pine giga-genomes. Molecular Ecology Resources 16: 1136–1146. Potvin, C, S.N. Aitken, F. Antil, E. Bennett, F. Berkes, J. Byrne, I. Creed, A. Cunsolo Willox, A. Dale, D. de Lange, M. Entz, L. Fraser, G. Hoberg and 46 other Canadian academics. 2015. Acting on climate change: Solutions from Canadian scholars UNESCO Chair for dialogues on Sustainability, Trottier Institute for Science and Public Policy, and Sustainable Canada Dialogues. Hamilton J.A., A.R. De La Torre, and S.N. Aitken. 2015. Fine-scale environmental variation contributes to introgression in a three-species spruce hybrid complex. Tree Genetics and Genomes 11: 1-14. Wang H, F. Cao, G. Li, W. Yu,and S.N. Aitken. 2015. The transcript profiles of a putative early light-induced protein (ELIP) encoding gene in Ginkgo biloba L. under various stress conditions. Acta Physiologiae Plantarum 37: 1-12. Aitken S.N. and S. Simard. 2015. Restoring forests. Alternatives Journal 41: 30-33. Aitken, S.N. and M.C. Whitlock. 2013. Assisted gene flow to facilitate adaptation to climate. Annual Review of Ecology, Evolution, and Systematics 44: 367-388. Allendorf, F.W., G. Luikart and S.N. Aitken. 2013. Conservation and the genetics of populations. Second Edition. Wiley-Blackwell. Hamann, A. and S.N. Aitken. 2013. Conservation planning under climate change: accounting for adaptive potential and migration capacity in species distribution models. Diversity and Distributions 19: 268-280. Sork, V.L., S.N. Aitken, R.J. Dyer, A.J. Eckert, P. Legendre, D.B. Neale. 2013. Putting the landscape into the genomics of trees: approaches for understanding local adaptation and population responses to changing climate. Tree Genetics and Genomes 9: 901-911. Wang, T., E.M. Campbell, G.A. O’Neill and S.N. Aitken. 2012. Projecting future distributions of ecosystem climate niches: Uncertainties and management applications. Forest Ecology and Management 279: 128-140. McLane, S.C., V.M. LeMay, and S.N. Aitken. 2011. Modeling lodgepole pine (Pinus contorta) radial growth relative to climate and genetics using universal growth-trend response functions. Ecological Society of America Ecological Applications 21: 776-788. McLane, S.C., Daniels, L.D., and S.N. Aitken. 2011. Climate impacts on lodgepole pine (Pinus contorta) radial growth in a provenance experiment. Forest Ecology and Management 262: 115-123. Bower, A.D. and S.N. Aitken. 2011. Changes in genetic diversity of whitebark pine (Pinus albicaulis Engelm.) associated with inbreeding and white pine blister rust. Silvae Genetica 60: 113-123. Bower, A.D., D. Kolotelo and S.N. Aitken. 2011. Effects of length of storage and stratification on germination of whitebark pine seeds. Western Journal of Applied Forestry 26: 24-29. Wang, T., G.A. O’Neill and S.N. Aitken. 2010. Integrating environmental and genetic effects to predict responses of tree populations to climate. Ecological Applications 20: 153-163. Holliday J.A., Ralph S., White R., Bohlmann J. and Aitken, S.N. 2008. Global monitoring of gene expression during autumn cold acclimation among rangewide populations of Sitka spruce [Picea sitchensis (Bong.) Carr.] New Phytologist 178: 103-122. Bower, A.D. and S.N. Aitken. 2008. Ecological genetics and seed transfer guidelines for Pinus albicaulis (Pinaceae). American Journal of Botany 95: 66-76. Ukrainetz, N. K., Kang, K.-Y., Aitken, S.N., Stoehr, M., Mansfield, S.D. 2008. Heritability, phenotypic and genetic correlations of coastal Douglas-fir (Pseudotsuga menziesii) wood quality traits. Canadian Journal of Forest Research. 38:1536-1546. Aitken, S.N., S. Yeaman, J. A. Holliday, T. Wang, and S. Curtis-McLane. 2008. Adaptation, migration or extirpation: climate change outcomes for tree populations. Evolutionary Applications 1(1): 95-111. O’Neill, G. A., N. Gordon, T. Wang, and P. K. Ott. 2007. Growth response functions improved by accounting for non-climatic site effects. Canadian Journal of Forest Research, 37:2724-2730. Wang T. and J.H.Russell. 2006. Evaluation of selfing effects on western redcedar growth and yield in operational plantations using TASS. Forest Science, 52:281-289. Bower, A.D. and S.N. Aitken. 2006. Geographic and seasonal variation in cold hardiness of whitebark pine. Can. J. For. Res. 36:1842-1850. Chuine, I., G.E. Rehfeldt and S.N. Aitken. 2006. Height growth determinants in pines: a case study of Pinus contorta and Pinus monticola. Can. J. For. Res. 36:1059-1066. Wang, T.,A. Hamann, D. Spittlehouse and S.N. Aitken. 2006. Development of scale-free climate data for western Canada for use in resource management. International Journal of Climatology 26: 383-397. Gapare, W.J. and S.N. Aitken. 2005. Strong spatial genetic structure in peripheral but not core populations of Sitka spruce (Picea sitchensis (Bong.) Carr.) Molecular Ecology 14: 2659-2667. Hamann, A. and Wang, T. 2005. Models of climatic normals for genecology and climate change studies in British Columbia. Agricultural and Forest Meteorology 128: 211-221. Krakowski, J., A. Benowicz, J.H. Russell and Y.A. El-Kassaby. 2005. Effects of serial propagation, donor age and genotype on Chamaecyparis nootkatensis physiology and growth traits. Can. J. For. Res. 35:623-632. Wheeler, N.C., K.D. Jermstad, K.V. Krutovsky, S.N. Aitken, G.T. Howe, J. Krakowski and D.B. Neale. 2005. Mapping of quantitative trait loci controlling adaptive traits in coastal Douglas-fir. IV. Cold hardiness QTL verification and candidate gene mapping. Molecular Breeding 15: 145-156. Bennuah, S.Y., T. Wang and S.N. Aitken. 2004. Genetic analysis of the Picea sitchensis x glauca introgression zone in British Columbia Forest Ecology and Management. Forest Ecology and Management 197: 65-77. Hamann, A., S. N. Aitken, A. D. Yanchuk. 2004. Cataloguing in situ protection of genetic resources for major commercial forest trees in British Columbia. Forest Ecology and Management 197: 295-305 (“Extended Manuscript and Data” PDF 484 Kb). Iddrisu, M.N. and K. Ritland. 2004. Genetic variation, population structure and mating system in bigleaf maple (Acer macrophyllum Pursch). Can. J. Bot. 82: 1817-1825. Wang, T., S.N. Aitken, J.H. Woods, K. Polsson and S. Magnussen. 2004. Effects of inbreeding on coastal Douglas-fir growth and yield in operational plantations: A model-based approach. Theoretical and Applied Genetics 108(6): 1162-1171. Wellman, H., C. Ritland and K. Ritland. 2004. Genetic effects of domestication in western hemlock, Tsuga heterophylla. Forest Genetics 10: 229-240. Howe, G.T., S.N. Aitken, D.B. Neale, K.D. Jermstad, N.C. Wheeler and T.H.H. Chen. 2003. From genotype to phenotype: Unraveling the complexities of cold adaptation in forest trees. Can. J. Bot. 81: 1247-1266. Wang, T.L., S.N. Aitken and K.L. Kavanagh. 2003. Selection for improved growth and wood quality in lodgepole pine: effects on phenology, hydraulic architecture and growth of seedlings. Trees Structure and Function 17:269-277. Anekonda, T.S., C. Lomax, W.T. Adams, K. L. Kavanagh and S.N. Aitken. 2002. Genetic variation in drought hardiness of coastal Douglas-fir seedlings from British Columbia. Can. J. For. Res. 32: 1701-1716. O’Neill, G.A., S.N. Aitken, J.N. King and R. Alfaro. 2002. Geographic variation in resin canal defenses in seedlings from the Sitka x white spruce introgression zone. Can. J. For. Res. 32: 390-400. Woods, J., Wang, T. and Aitken, S.N. 2002. Effects of inbreeding on coastal Douglas-fir: nursery performance. Silvae Genetica 51(4): 163-170. Adams, W.T., S.N. Aitken, D.G. Joyce, G.T. Howe and J. Vargas-Hernandez. 2001. Evaluating efficacy of early testing for stem growth in coastal Douglas-fir. Silvae Genetica 50(3-4): 167-175. Aitken, S.N. and M. Hannerz. 2001. Genecology and gene resource management strategies for conifer cold hardiness. Chapter 2 in “Conifer Cold Hardiness”, F. Bigras and S. Columbo, Eds. Kluwer Academic Press, NY. Gapare, W. J., Hodge, G. R., & Dvorak, W. S. 2001. Genetic Parameters and Provenance Variation of Pinus maximinoi in Brazil, Colombia and South Africa. Forest Genetics 8(2): 159-170. Hannerz, M., S.N. Aitken, T. Ericsson and C. C. Ying. 2001. Variation in strobili production within and among provenances of lodgepole pine. Forest Genetics 8(4):325-331. Jermstad, K.D., D.L. Bassoni, N.C. Wheeler, T.S. Anekonda, S.N. Aitken, W.T. Adams and D.B. Neale. 2001. Mapping of quantitative trait loci controlling adaptive traits in coastal Douglas-fir: II. Spring and fall cold-hardiness. Theoretical and Applied Genetics 102: 1142-1151. O’Neill, G.A., W.T. Adams and S.N. Aitken. 2001. Quantitative genetics of spring and fall cold hardiness in seedlings from two Oregon populations of coastal Douglas-fir. For. Ecol. and Mgmt. 149: 305-318. Wang, T. and S.N. Aitken. 2001. Selection for improved growth and wood quality in lodgepole pine: effects on xylem anatomy of tree stems. Can. J. For. Res. 31: 2049-2057. Anekonda, T.S., W.T. Adams, and S.N. Aitken. 2000. Cold hardiness testing for Douglas-fir tree improvement programs: Guidelines for a simple, robust, and inexpensive screening method. West. J. Appl. For. 15(3):129-136. Anekonda, T.S., W.T. Adams, S.N. Aitken, D.B. Neale, K. D. Jermstad, N.C. Wheeler et al. 2000. Genetics of cold hardiness in a cloned full-sib family of coastal Douglas-fir (Pseudotsuga menziesii var. menziesii (Mirb.) Franco). Can. J. For. Res. 30(5): 837-840. Dvorak, W.S., Gutierrez, E. A., and Gapare, W. J. 2000. Pinus maximinoi. In: Conservation and Testing of Tropical and subtropical Species by the CAMCORE Cooperative. pp: 107-127. Gapare, W. J. 2000. Predicted and Realised Genetic Gain in Eucalyptus grandis breeding seedling orchard in Zimbabwe. Southern African Forestry Journal 189: 11-16. Gapare, W. J. 2000. Growth and Productivity Performance of some Provenances of Pinus maximinoi H.E. Moore in Brazil, Colombia and South Africa. In: Proceedings “Forest Genetics for the next Millenium” IUFRO Working Party 2.08.01, Durban, South Africa, 8-13 October 2000. Hamann A. 2000. Utilization and management of red alder genetic resources in British Columbia. For. Chr. Hamann, A. 2000. Fruiting and flowering phenology of a Philippine submontane rainforest: Climatic factors as proximate and ultimate causes. J. Ecol. Hamann, A. 2000. The North Negros Forest Reserve: A biodiversity hotspot at risk. Canopy Int. Hamann, A., Koshy, M., and Namkoong, G. 2000. A multiple population breeding strategy for uncertain climatic futures: a case study with red alder. Paper presented at IUFRO conference: Genetic response of forest systems to changing environmental conditions. University of Munich, Freising, Germany, September 12-17, 1999. Hamann, A., Koshy, M., and Namkoong, G. 2000. Improving estimates of breeding values by removing spatially autocorrelated error variation in field experiments. For. Sci. Hamann, A., Koshy, M., Namkoong, G. and Ying C. C. 2000. Genotype × environment interactions in Alnus rubra Bong. : developing seed zones and seedtransfer guidelines with spatial statistics and GIS. For. Ecol. Manage. 136 107-119. Kavanagh, K.L., B.J. Yoder, S.N. Aitken, B.L. Gartner and S.A. Knowe. 1999. Vulnerability to xylem cavitation in Pseudotsuga menziesii var. menziesii and var. glauca. Tree Physiology 19:31-37. Namkoong, G., M. Koshy and S.N. Aitken. 2000. Selection. 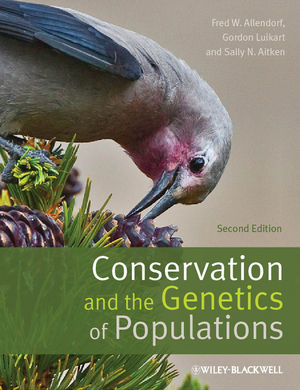 In: “Forest Conservation Genetics: Principles and Practice”, Boyle, T.J.B., Young, A., and Boshier, D. (eds), CSIRO, Canberra, Australia. Pp. 101-111. O’Neill, G.A., S.N. Aitken and W.T. Adams. 2000. Genetic selection for cold hardiness in coastal Douglas-fir seedlings and saplings. Can. J. For. Res. 30: 1799-1807. Wang, T., S.N. Aitken, P. Rozenberg and F. Millier. 2000. Selection for improved growth and wood density in lodgepole pine: Effects on radial patterns of wood formation. Wood and Fiber Science. 32(4): 391-403. Aitken, S.N. 1999. Conserving adaptive variation in forest ecosystems. Journal of Sustainable Forestry 8(7/8): 1-10. Balduman, L.M., S.N. Aitken, M. Harmon and W.T. Adams. 1999. Genetic variation in cold hardiness of Douglas-fir in relation to parent-tree environment. Can. J. For. Res. 29(1):62-72. Hannerz, M., S.N. Aitken, J.N. King and S. Budge. 1999. Effects of genetic selection for growth on frost hardiness in western hemlock. Can. J. For. Res. 29(4):509-516. Hamann, A. and Curio, C. 1999. Interactions between frugivores and fleshy fruit trees in a Philippine submontane rainforest. Cons. Biol. 13: 766-773. Hamann, A., Barbon, Curio, E., and Madulid, D. A. 1999. A botanical inventory of a submontane rainforest on Negros island, Philippines. Biodiv. Cons. 8: 1017-1031. Wang, T., S.N. Aitken, P. Rozenberg and M.R. Carlson. 1999. Selection for height growth and Pilodyn pin penetration in lodgepole pine: effects on growth traits, wood properties, and their relationships. Can. J. For. Res. 29(4):434-445. Anekonda, T.S., W.T. Adams and S.N. Aitken. 1998. Influence of second flushing on genetic assessment of cold hardiness in coastal Douglas-fir (Pseudotsuga menziesii var. menziesii (Mirb.) Franco). Forest Ecology and Management 4440: 1-8. Hamann, A. 1998. Adventitious root formation in cuttings of loblolly pine (Pinus taeda L.): developmental sequence and effects of maturation. Trees 12: 175-180. Hamann, A., E1-Kassaby, Y., Koshy, M., and Namkoong, G. 1998. Multivariate analysis of allozymic and quantitative trait variation in red alder (Alnus rubra Bong. ): geographic patterns and evolutionary implications. Can. J. For. Res. 10: 1557-1565. Aitken, S.N. and W.T. Adams. 1997. Spring cold hardiness is under strong genetic control in Pseudotsuga menziesii var. menziesii. Can. J. For. Res. 27(11):1773-1780. Curio, E., Hamann, A., and Lastimoza, L. 1997. The appearance and status of the Writhed-billed Hornbill (Aceros waldeni). OBC Bulletin 23: 18-21. Schermann, N., W.T. Adams, S.N. Aitken and J.-C. Bastien. 1997. Genetic parameters of stem form traits in a 9-year-old coastal Douglas-fir progeny test. Silvae Genetica 46(2-3): 166-170. Aitken, S. N., W. T. Adams, N. Schermann and L. H. Fuchigami. 1996. Family variation for fall cold hardiness in two Washington populations of coastal Douglas-fir (Pseudotsuga menziesii var. menziesii (Mirb.) Franco). Forest Ecology and Management 80: 187-195. Aitken, S. N. and W. T. Adams. 1996. Genetics of fall cold hardiness in coastal Douglas-fir in Oregon. Canadian Journal of Forest Research 26:1828-1837. Curio, E., Hamann, A., Heubuschl, P. and Lastimoza, L. 1996. Hornbill research and conservation in the Philippines. EEP Hornbill TAG Newsletter 2: 26-27. Aitken, S. N. and W. T. Adams. 1995. Impacts of genetic selection for height growth on annual developmental cycle traits in coastal Douglas-fir. P. AD-1 In ‘Evolution of breeding strategies for conifers from the Pacific Northwest. Proc., IUFRO Conference, 31 July – 4 Aug. Limoges, France. Aitken, S. N. and W. T. Adams. 1995. Screening for cold hardiness in coastal Douglas-fir. In Eucalypt Plantations: Improving Fiber Yield and Quality (eds.) B. M. Potts, N. M. G. Borralho, J. B. Reid, R. N. Cromer, W. N. Tibbits and C. A. Raymond. Pp. 321-324. Proc. CRC-IUFRO Conf., (Hobart, Australia). Aitken, S. N., K. L. Kavanagh and B. J. Yoder. 1995. Genetic variation in seedling water-use efficiency as estimated by carbon isotope ratios and its relationship to sapling growth in Douglas-fir. Forest Genetics 2 (4): 199-206. Aitken, S. N., and W. J. Libby. 1994. Evolution of the pygmy-forest edaphic subspecies of Pinus contorta across an ecological staircase. Evolution 48 (4): 1009-1019.